6 pm to 7 pm Mondays: Zumba with Marissa Gomez. **See calendar for possibly schedule class changes. Cost is $5 per class. 7 pm to 8 pm Mondays with Richard Ortiz: This exciting 8 week salsa bootcamp will continue where bootcamp 1 left off and take students to a higher level. For those that have NOT taken Salsa Bootcamp 1 and believe they can jump into 2, see Richard to see if you qualify. Partners are not required. Too late to register for current Bootcamp. Join us for the new Bootcamp will start on Monday, May 13, 2019 through July 8, 2019. No class on May 27, due to Memorial Day holiday. 8 pm to 9 pm Mondays with Richard Ortiz: This exciting 8 week salsa bootcamp will get you started from scratch and have you club ready by the time of completion. Partners are not required. 6 pm to 7 pm Tuesdays: with Marissa Gomez. 7 pm to 8 pm Tuesdays: Classes include basic instructions in fox trot, swing, tango, cha cha, waltz and rumba. Partners are not required, however highly recommended. Best time for new beginners to start is at the beginning of the month. $45 for singles or $75 for couples for 4 Tuesday classes. $45 for singles for 4 Tuesday classes. $75 for couples for 4 Tuesday classes. 7 p.m. to 8 p.m. Tuesdays: These classes are designed for new beginners. Students will learn body movement, footwork, and partner communication. Partners are not required, however highly recommended. $45 for singles for 4 Tuesday classes. 8 p.m. to 9 p.m. Tuesdays: Requirements: Completion of Beginner Bachata 1 (must complete 3 out of 4 classes). Students will learn body movement, footwork, and partner communication. Partners are not required, however highly recommended. $45 for singles for 4 Tuesday classes. 8 pm to 9 pm Tuesdays: Students will learn basic follow, lead, turn and combo variations. Partners are not required, however highly recommended. Classes progress each week. 6 pm to 7 pm Wednesdays: with Marissa Gomez. 6:30 pm to 8 pm Wednesdays: Learn the ancient art of cabaret (glitzy) belly dance instruction by instructor Marlene Delachica-Hiebert. Students will learn movements, such as, hip circles, figure eights, hip isolations, steps, turns, shimmies and more. No experience required and students may start at anytime. For more details call, Marlene Delachica-Hiebert at 512-657-3241. 8 pm to 9 pm Wednesdays: This course is a step up from Country 2 Step #1. REQUIREMENT: Completion of Country Two Step Level 1 - 8-9 pm on Tuesdays. Students will learn new turn and swing patterns in this class. Partners are not required, however highly recommended. Classes progress each week. $45 for singles for 4 Wednesdays classes. $75 for couples for 4 Wednesdays classes. Salsa for beginners. Students will learn the fundamentals of basic follow, lead, turn and combo variations as well as footwork and partner work. Partners are not required. Please bring shoes that you can turn easy on the ball of your feet. Dance shoes are even better. No tennis shoes or shoes that slip off. Best time for new beginners to start is at the beginning of the month. $15 per class for drop ins $45 for singles for 4 Thursday classes. $75 for couples for 4 Thursday classes. 7 p.m. to 8 p.m. Thursdays: RThese classes are designed for the seasoned bachata dancers. Requirements: completion of beginner Bachata 1 & 2. Partners are not required. however highly recommended. Classes progress each week, best time to start is at the beginning of the month. $45 for singles for 4 Thursday classes. Great way to build on your Salsa skills. Requirements: Students must know right turns, left turns, cross body leads and basic follow and lead skills. Partners are not required. Best time for new beginners to start is at the beginning of the month. with Marissa Gomez. No Zumba on the last Saturdays of the month. 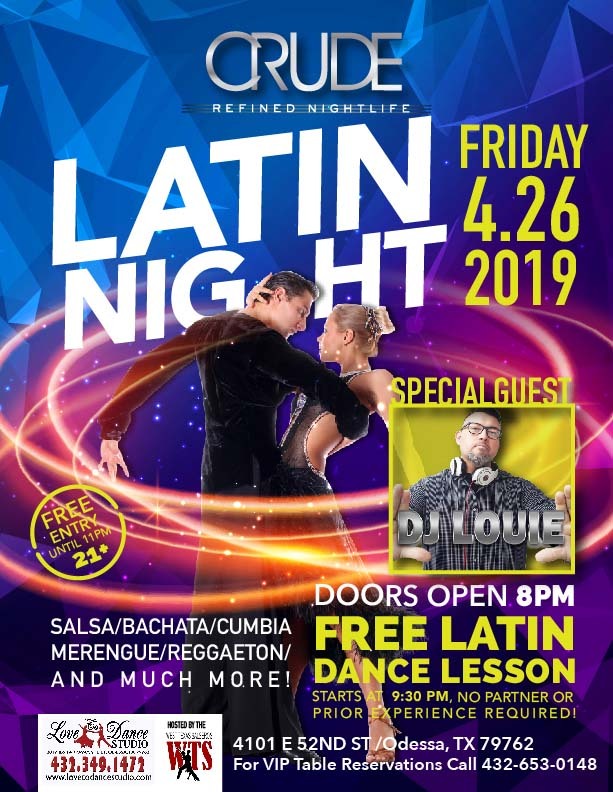 Add some grooves and flows to your Latin dancing. 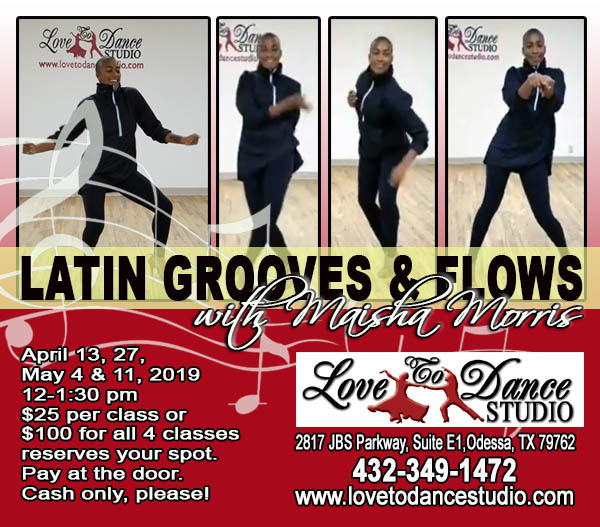 Join this fun and exciting new classes with Maisha Morris. $25 per class or $100 for all 4 classes to reserve your spot.